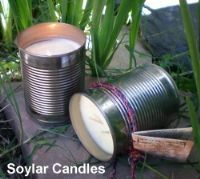 Handmade soy candle in a 14 ounce recycled tin can. A special can opener creates a smooth safe edge, making our cans reusable. Select your choices from the menus below and I will make your candles fresh for you. Some cans may have rust or dents. Can shapes may vary and are mostly from canned fruits and vegetables. Please recycle after use.